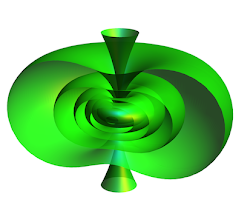 One of the classic ways of understand the torus is by anything that involves two circles, such as a system with two independent angular variables—roughly speaking, it is because the torus has two families of circles, one surrounding the tube, and another surrounding the hole. The classic example of such a system is a double pendulum, which is one pendulum hung off the pendulum bob of another. Double pendulum: the path is traced by the second bob and fills a path within the annulus. If we imagine that the second circle goes into and out of the page instead, we can see it as a path on a torus. Of course, it is not immediately apparent why one would find it advantageous to consider a whole torus, as opposed to two distinct circles, other than for cool visualization purposes, so we should explain this. First, many interesting possibilities arise when the two angular variables are not independent: they bear some complicated relationship imposed by, say, physics, in this case. Not all the possibilities are there, at least, in a short amount of time, and it merely traces some path through this grand torus. The dynamics of the interaction is something that makes the system transcend merely "having two angles". This notion of "where all the variables live together" is historically what led to the development of the theory of manifolds. Think again to parametrizations and equations, where variables that we might only know, initially, lie in some Euclidean space, either get warped into more complicated spaces, or, when constrained, lead to funny subsets where, and only where, the constraint is satisfied. These state spaces (or configuration spaces) are everywhere, at least implicitly in any kind of modeling of real-world objects and their dynamics. 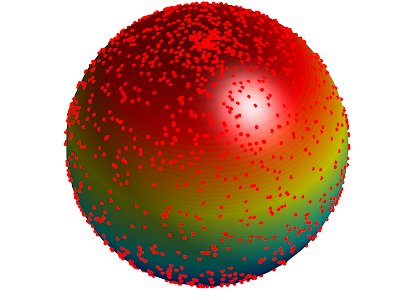 This visualization was coded in MATLAB, using a symplectic integrator (in order more accurately reflect the energy-conservation). We delve into the calculational specifics of this example in a future post.